Poisoned Pen Press, 9781590588031, 232pp. 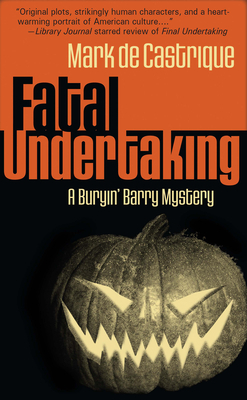 Funeral director and part-time sheriff Barry Clayton finds Archie Donovan's request absurd until he learns the casket will be the centerpiece of the Jaycees' haunted house, with all proceeds going to the children's hospital. But when the president of the Jaycees is found murdered in the casket on Halloween, the national press descends to cover the bizarre crime. The case presents no motive and no suspects. Then someone fires a shot at Donovan, and Barry wonders whether the victim in the casket was even the intended target. Barry's police work and personal life collide as his ex-wife Rachel comes to town hoping to use the case to launch a TV network career. Soon her prying creates a backlash that leaves another body in its wake. Barry must follow a trail of clues to an unexpected destination: a mountainside of Christmas trees. Somewhere behind them lurks a killer. Unmasking him may be a fatal undertaking.